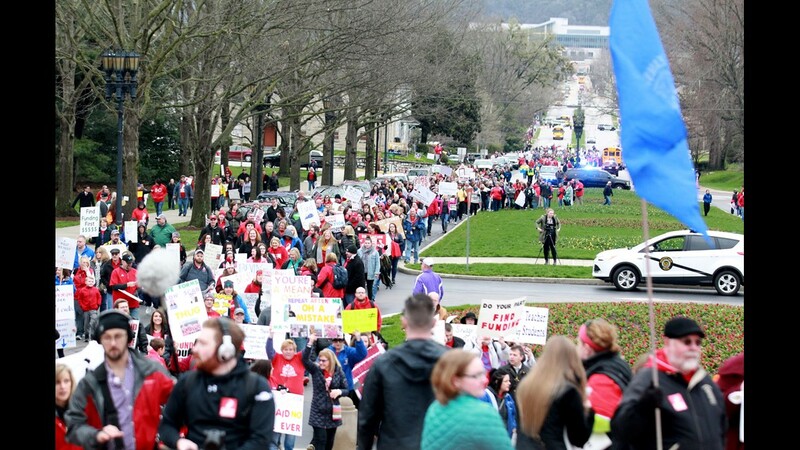 Thousands of Kentucky teachers and their supporters rallied April 2, 2018, at the state Capitol in Frankfort because of recent changes that the state legislature made to their pensions. 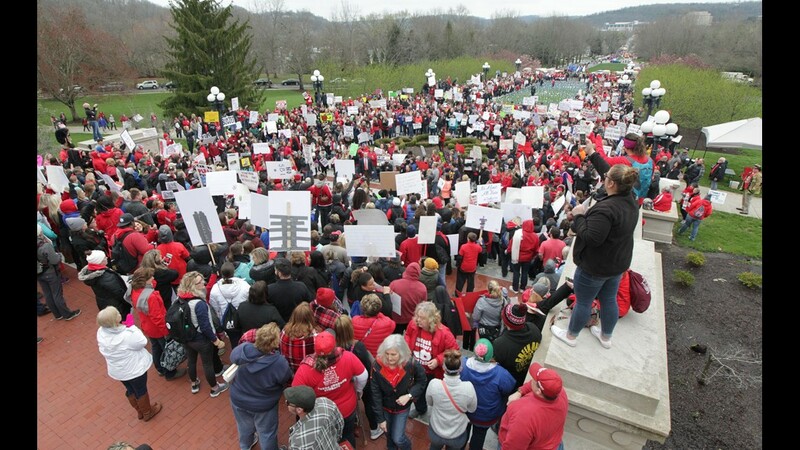 FRANKFORT, Ky. — Just a day after Kentucky's governor warned that a teacher walkout would be irresponsible and a mistake, the statewide teachers union called for public employees to return Friday to the Capitol when lawmakers return to session. 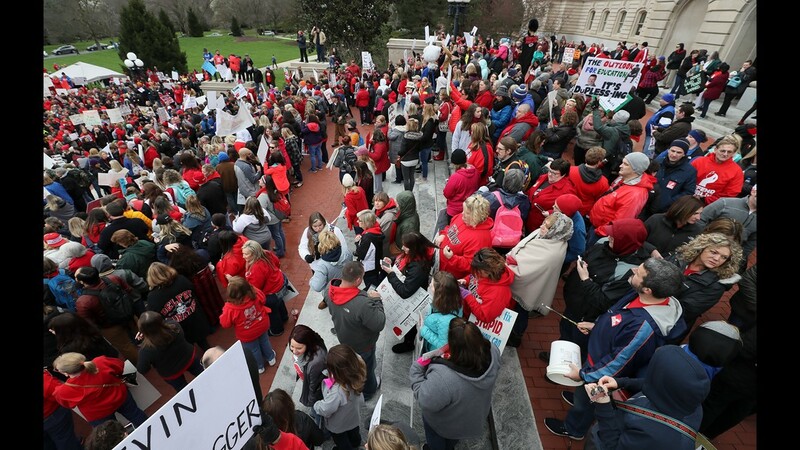 The Kentucky Education Association is encouraging members who can legally be in Frankfort on Friday to do so, calling it a "day of action at the Capitol," President Stephanie Winkler said. 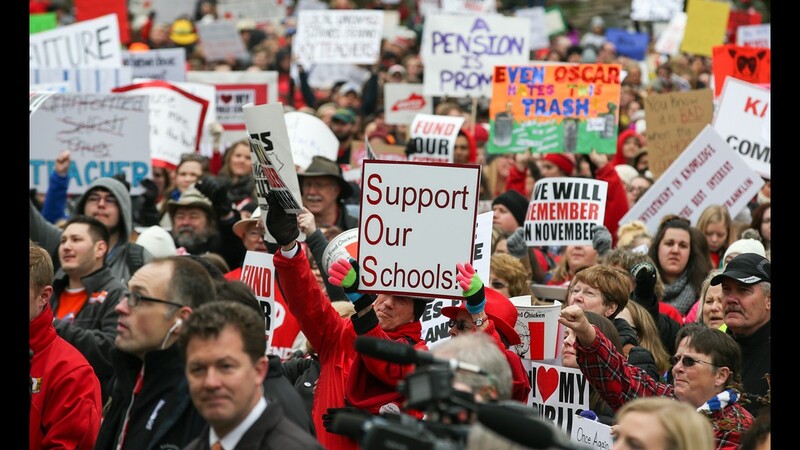 "Closing schools is a decision for the superintendent to make. We have asked superintendents that plan to be open on Friday to allow as many people as possible to attend using any available personal or professional leave," Winkler said. 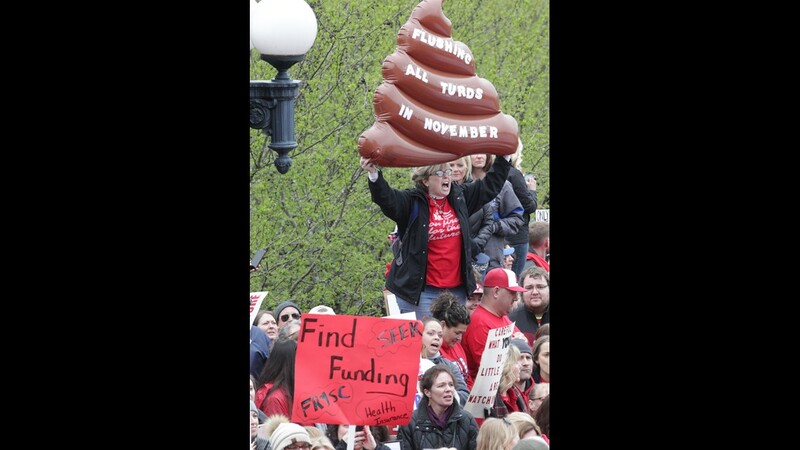 "All activity will be focused on legislative advocacy at the Capitol and Annex." 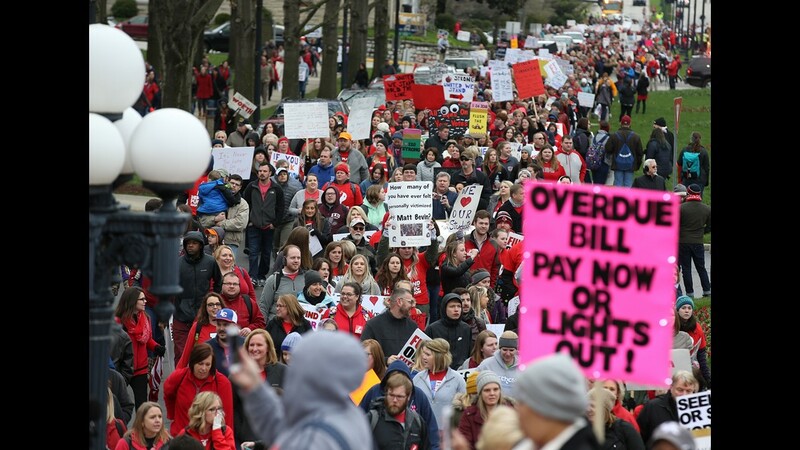 Nearly 30 school districts closed March 30 because of a sickout so teachers could protest the way lawmakers passed a pension reform bill, which was introduced and passed through both chambers in a matter of hours. 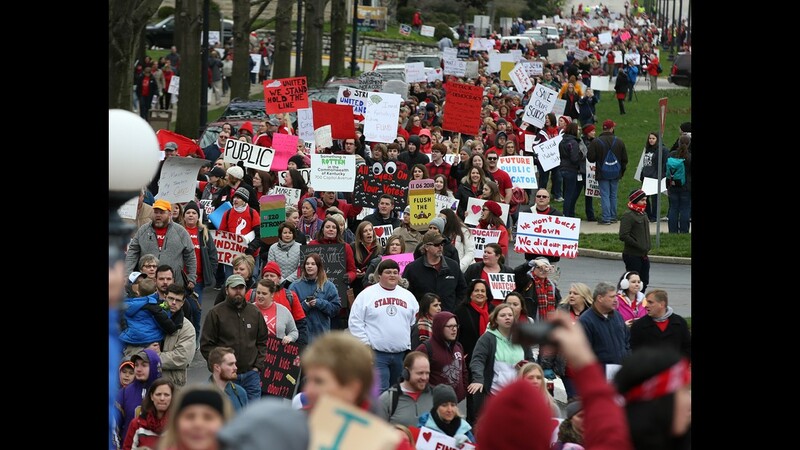 The next Monday, districts in all 120 counties were closed as more than half the schools started spring break and thousands of teachers flocked to Frankfort for a rally. 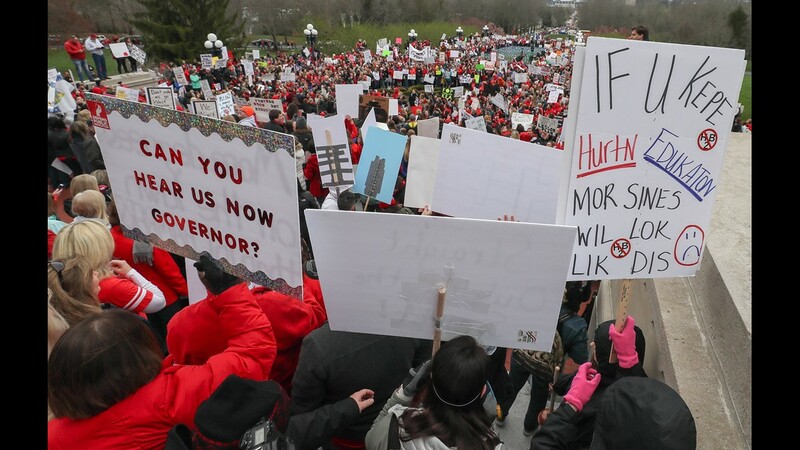 GOP Gov. 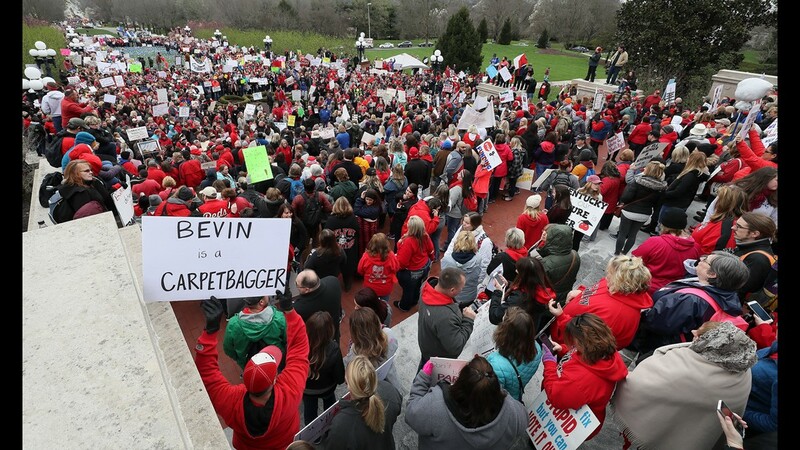 Matt Bevin signed the teachers' pension bill into law Tuesday, a day after vetoing the budget and tax reform bills. 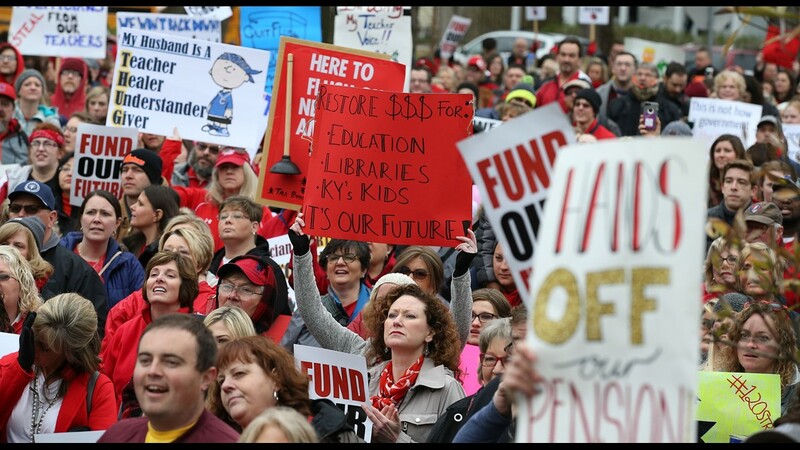 At a press conference announcing his vetoes, he advised against a teacher action, saying the Kentucky Education Association is the problem. 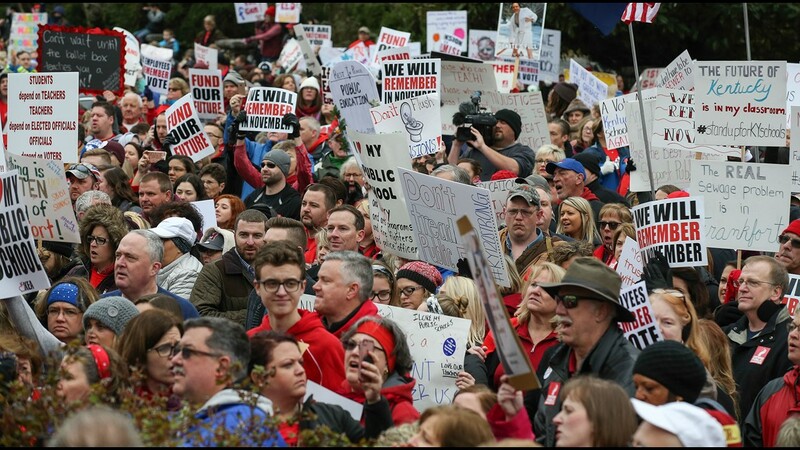 He reiterated that sentiment in the afternoon in an interview with WHAS-AM, Louisville, saying the union has been on both sides of the tax and budget bills and is not looking out for the interests of teachers. 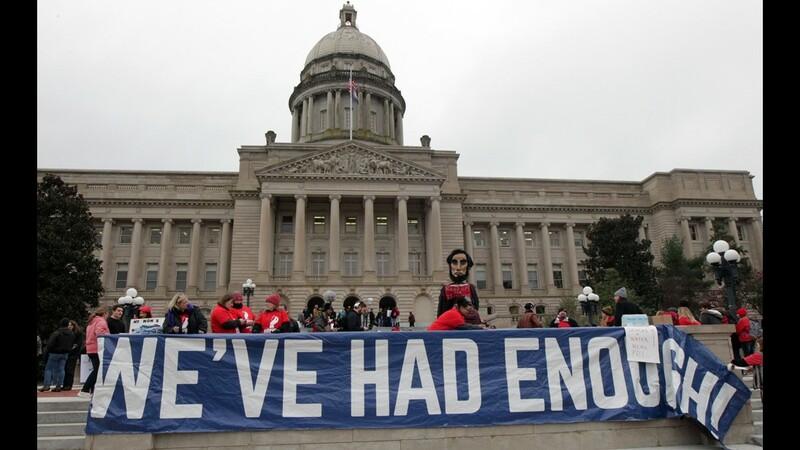 "They're absolute frauds," Bevin said. "They're looking out for the best interests of themselves." 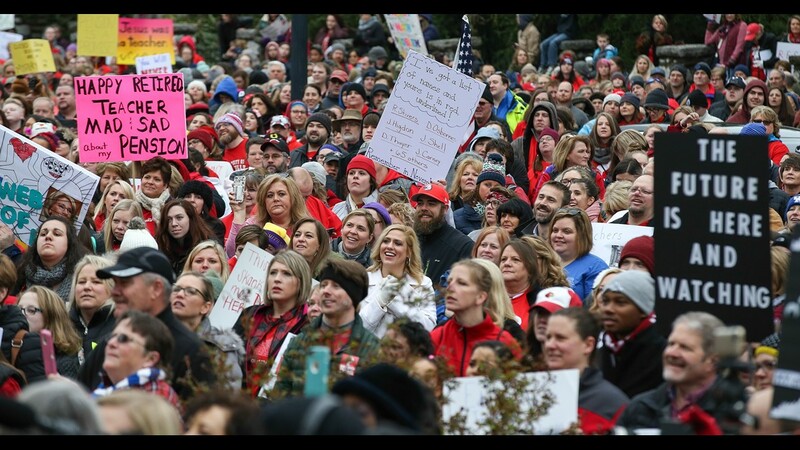 Kentucky's teacher protest is different from ones that have closed schools in West Virginia, Oklahoma and now potentially Arizona. While those teachers were walking out in part because of pay so low that many had to work two and three jobs, teachers in Kentucky are worried about their chronically underfunded state pension plan. 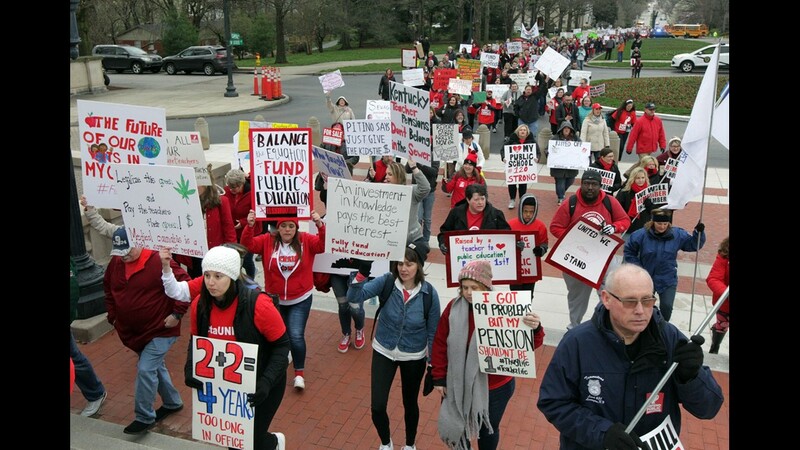 In fiscal 2016, all of the state's pension funds — the teachers plan is the largest of them — had less than a third of the money, 31.21%, they needed to pay retirees, according to Standard & Poor's. Only New Jersey had a lower ratio, 30.93%. By contrast, neighboring Tennessee was No. 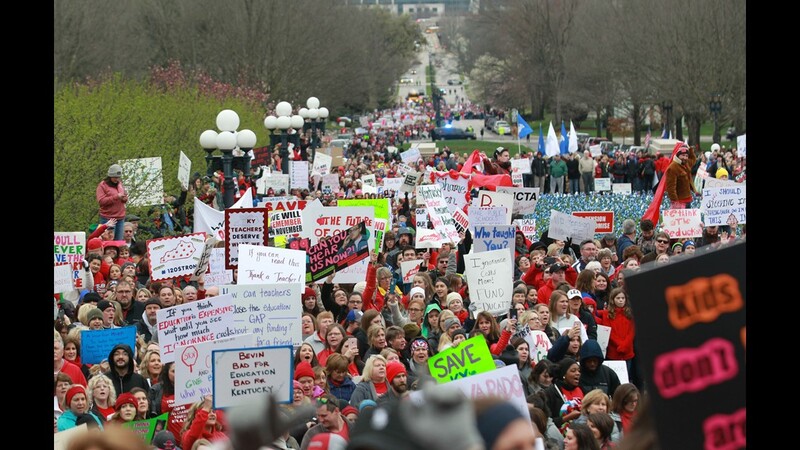 4 on the best-funded list with 88.04% of its future obligations accounted for; Wisconsin was No. 1 at 98.2%. 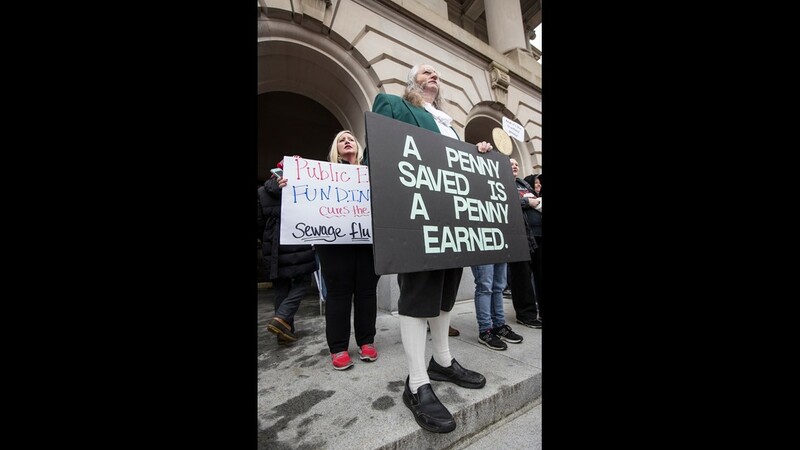 The difference between the best and worst states was a matter of states' discipline in paying into pension accounts through the years, the financial research company said. 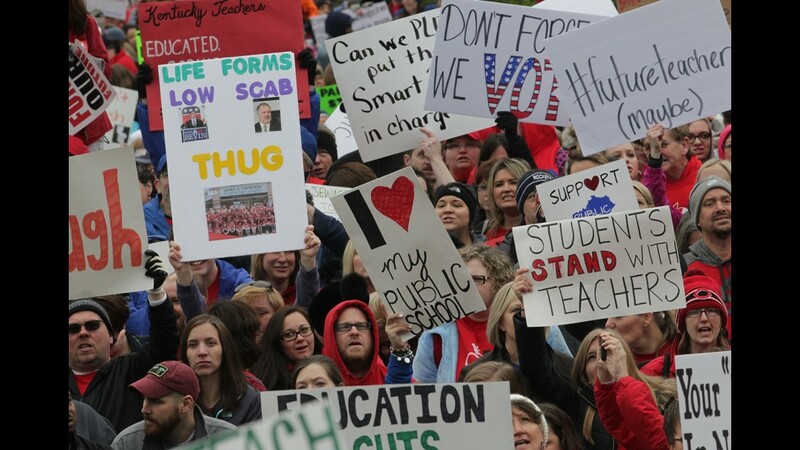 In average teacher salaries, Kentucky is in the middle, ranking 26th among states, $52,134 in 2016, according to the National Education Association. 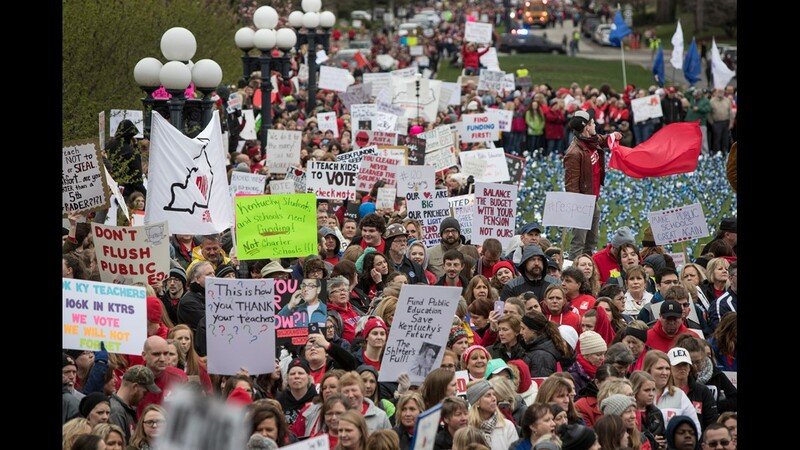 The average teacher salaries in Arizona, Oklahoma and West Virginia fell between 2015 and 2016, and those states' averages ranked 43, 49 and 48. Mississippi and South Dakota were the lowest but showed some salary increases in that same period. 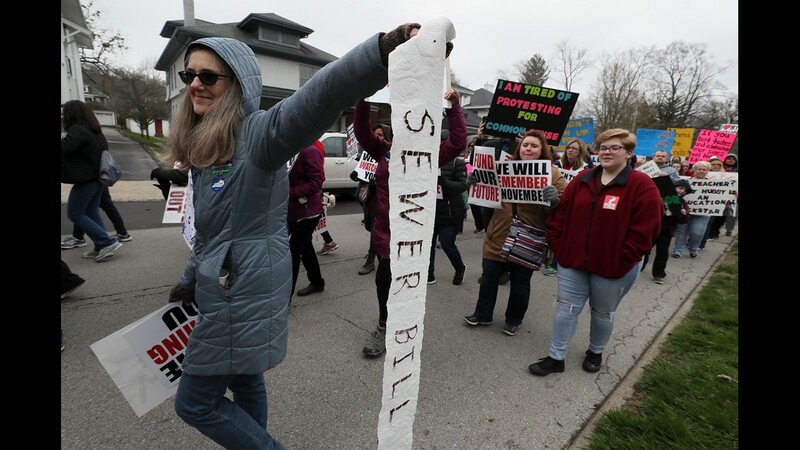 Kentucky's surprise pension reform plan was tacked onto a wastewater services bill March 29 without input from educators and went through a committee and both houses the same day. 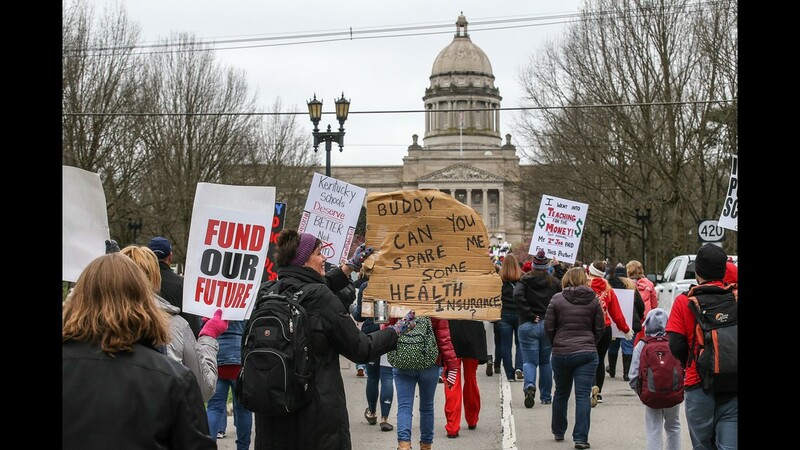 It actually does not fix the problem of too little money being set aside in the states' pension plans and instead limits coverage of future employees. 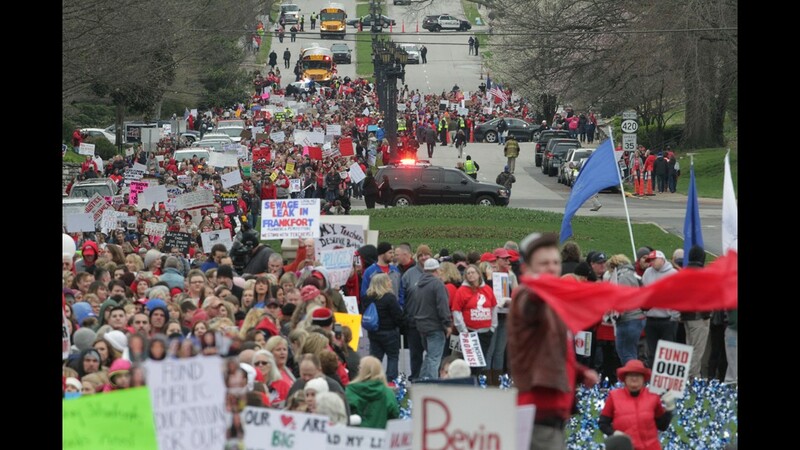 ► April 4: When teachers close the schools in protest, what happens to the kids? 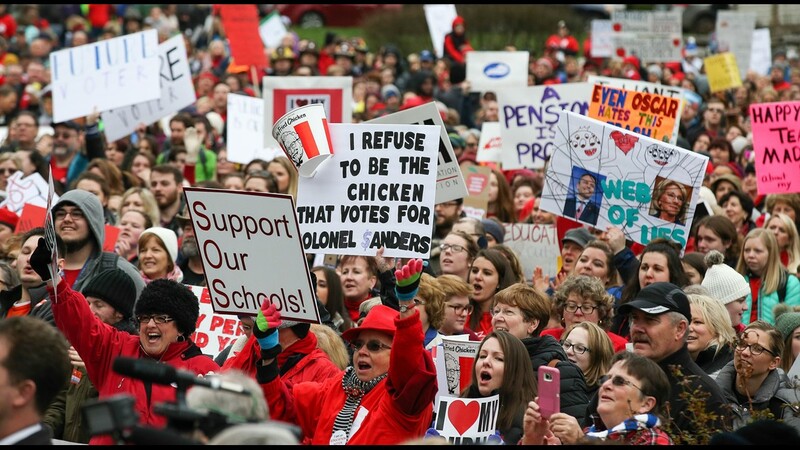 It does not include reductions in cost-of-living increases for retired teachers nor change how long current teachers just work before being eligible for full retirement benefits, previous objections to reforms. 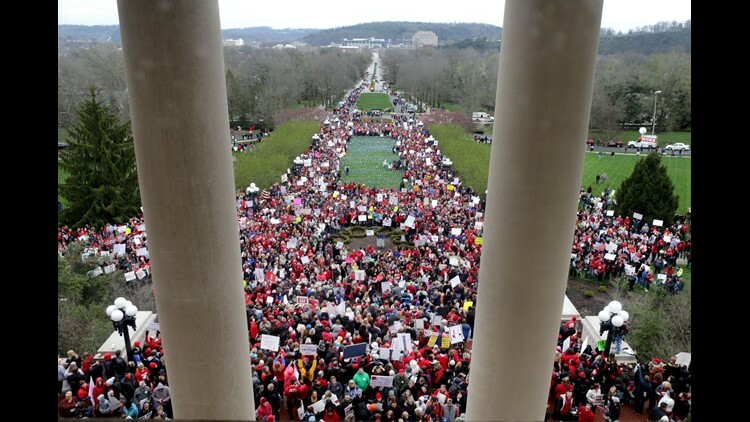 But it moves those future hires from the current defined-benefit pension plan into one that includes features of both a traditional pension and a 401(k)-style plan in which teachers will have to pay for much of their retirement out of their own salaries, a transformation at the forefront of private-sector pensions in the past 40 years. 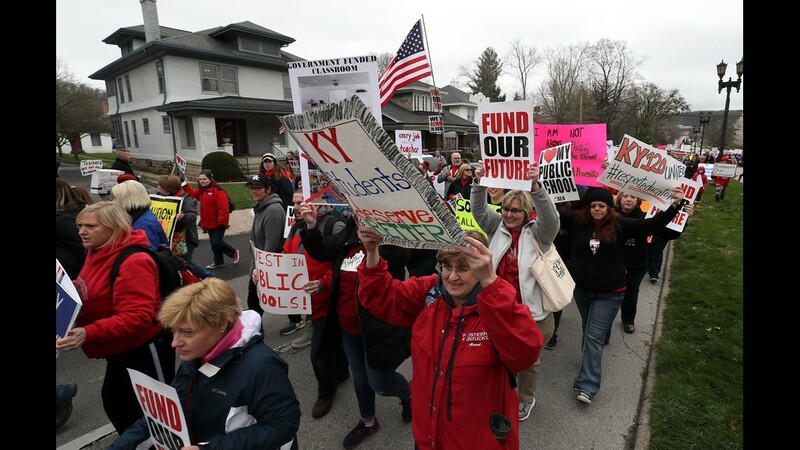 The changes will make it more difficult for school districts to attract good teaching candidates, teachers have said. 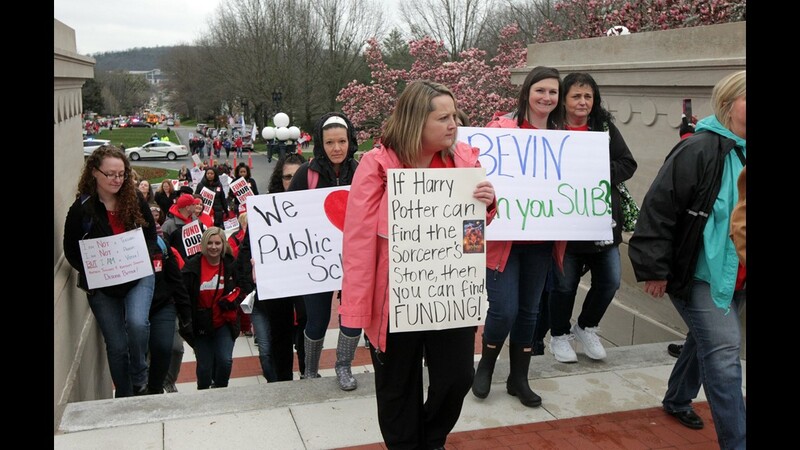 And Bevins' veto of a two-year budget proposal that would have allocated hundreds of millions of dollars to public education, increasing per-pupil spending to $4,000, is a continuation of a long-standing problem of skimping on schools. 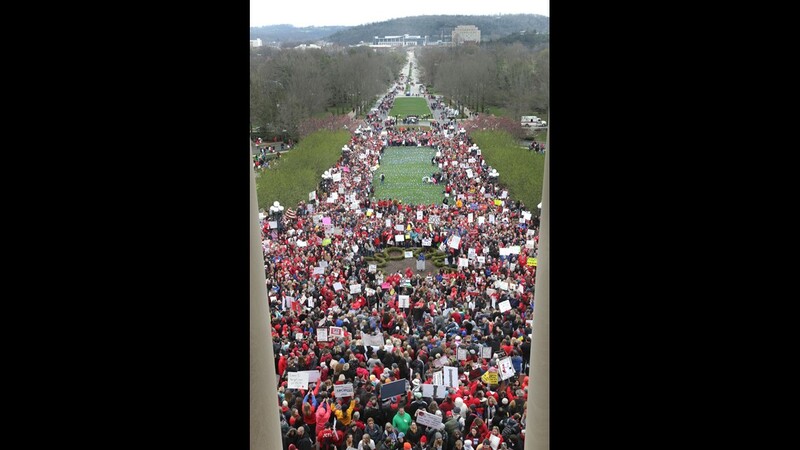 Brent McKim, the president of the Jefferson County teachers union, is urging teachers to use a personal day, if possible, to travel Friday to the state Capitol. The idea of a sickout is not a good one, he said. 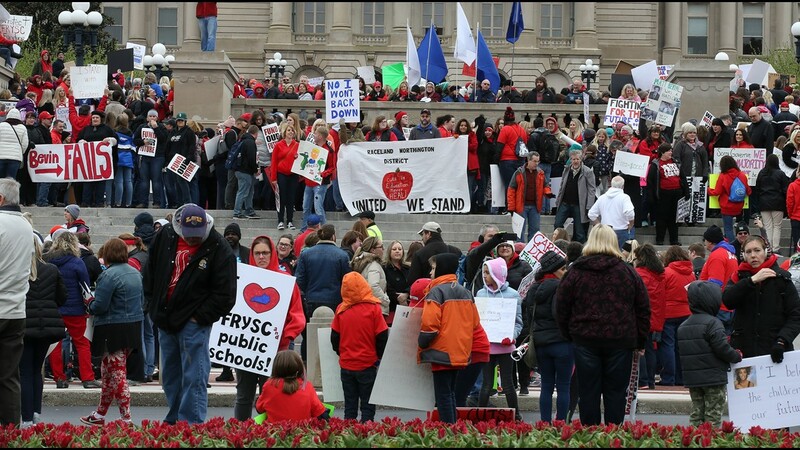 "We have seen teachers in JCPS (Jefferson County Public Schools) and across the state in the past lose their jobs due to misuse of a sick day," he said. "It's not something to take lightly." 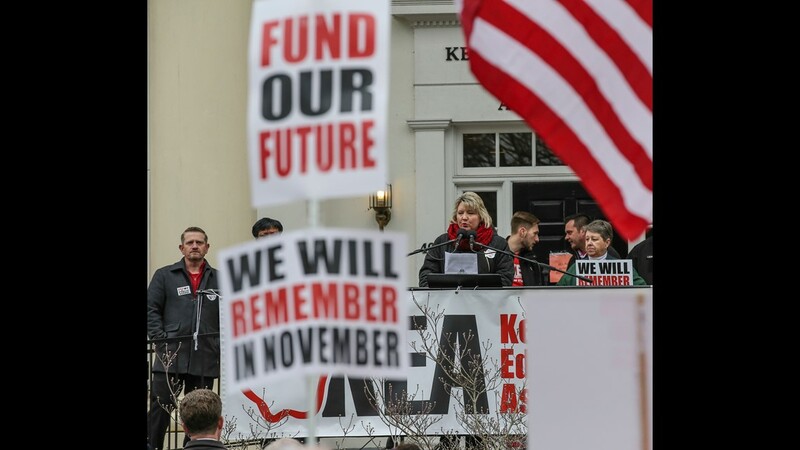 When school boards set calendars, superintendents have the authority to close school only if it's an emergency, said Tom Shelton, executive director of the Kentucky Association of School Superintendents. 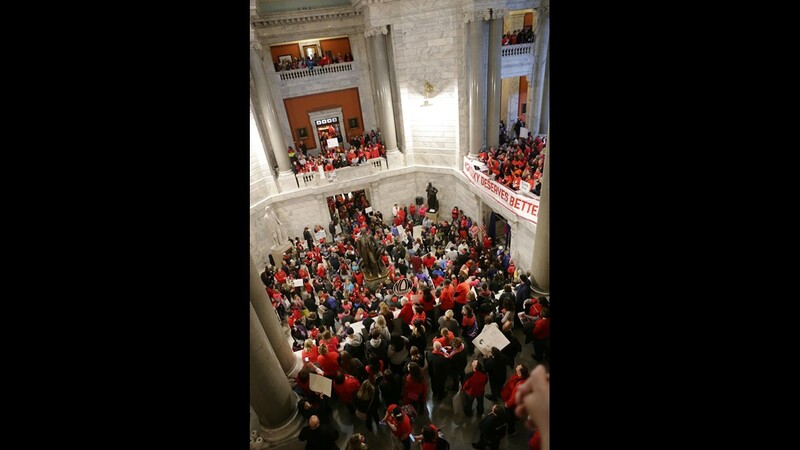 The group is encouraging each district to send a delegation to Frankfort, Shelton said. 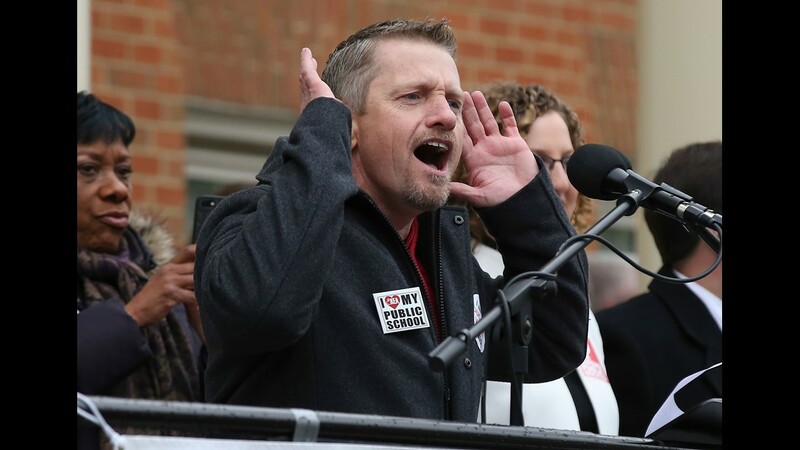 "We just encourage every superintendent to continue to allow that to happen to make sure that staff are representing them and their district," he said. 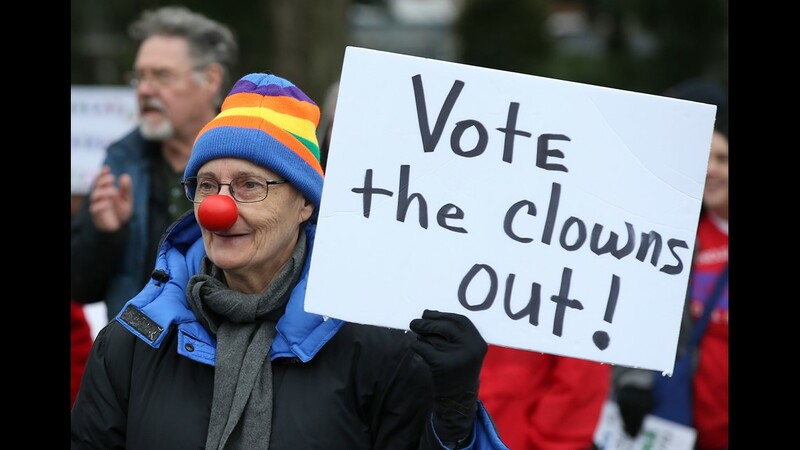 "But obviously, local circumstances might call for them to do more than that." 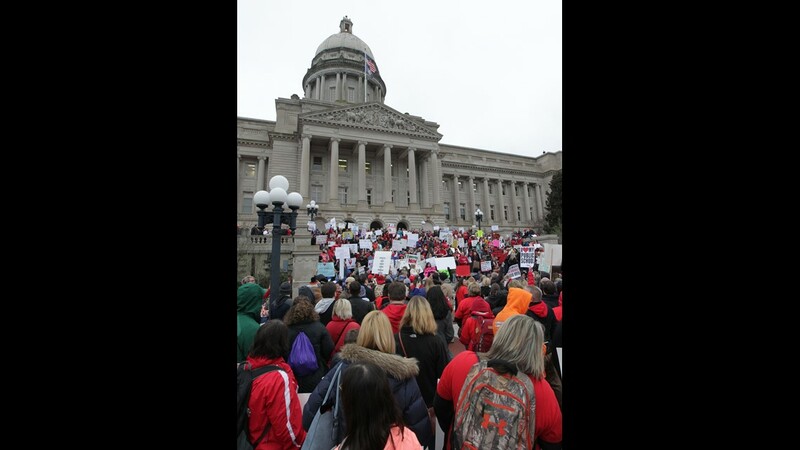 Hardin County Schools, about 20 miles south of Louisville, plan on sending a small group of teachers to the Capitol, the district's communications director Melissa Blankenship said. "I don't think we're anticipating a closure at this point," she said. 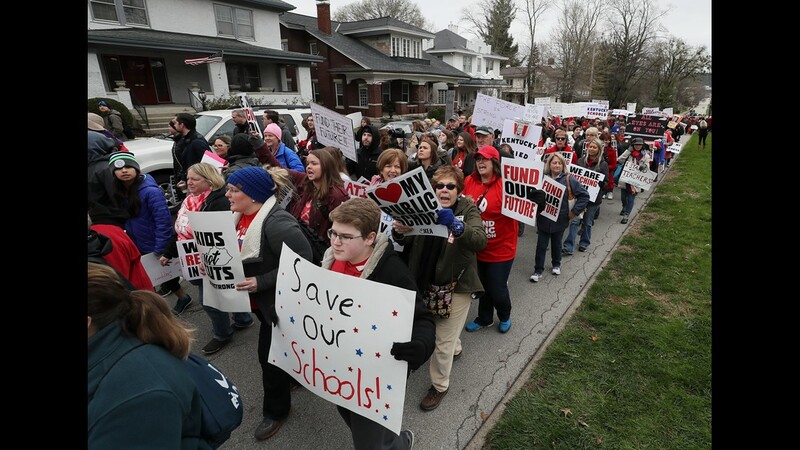 At least one district, Trimble County Schools, already has announced plans to close Friday "so that our school educators and personnel are able to travel to Frankfort in support of public education." The rural county along the Ohio River is about 35 miles northeast of Louisville. 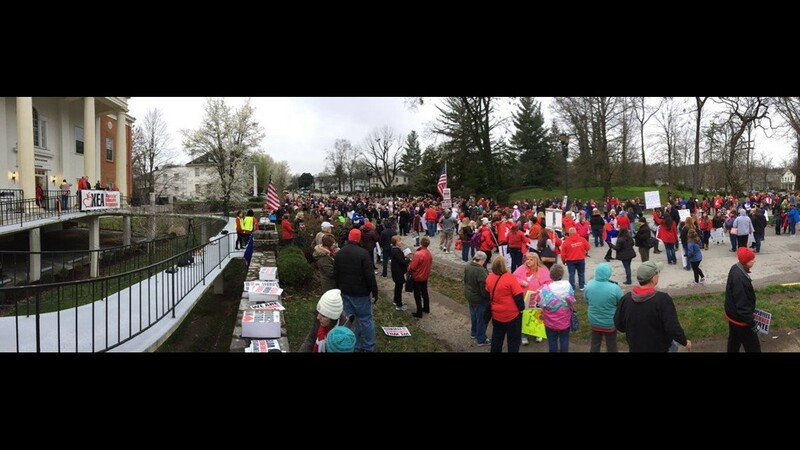 "We hope that making the decision this early in the week is helpful in providing ample time to make arrangements for child care, etc.," the district posted Monday on Facebook. "Thank you for your support and we apologize for any inconveniences that this may cause for you or your family." 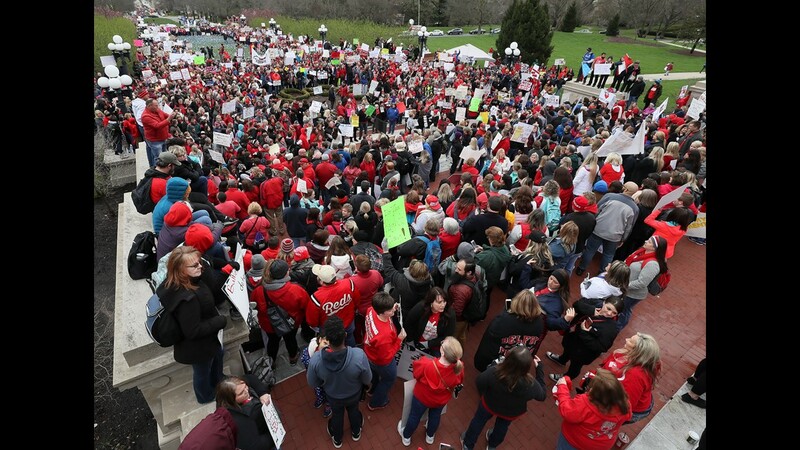 Thousands of Kentucky teachers and their supporters rallied at the State Capitol over recent changes that the state legislature made to their pensions. April 2, 2018. 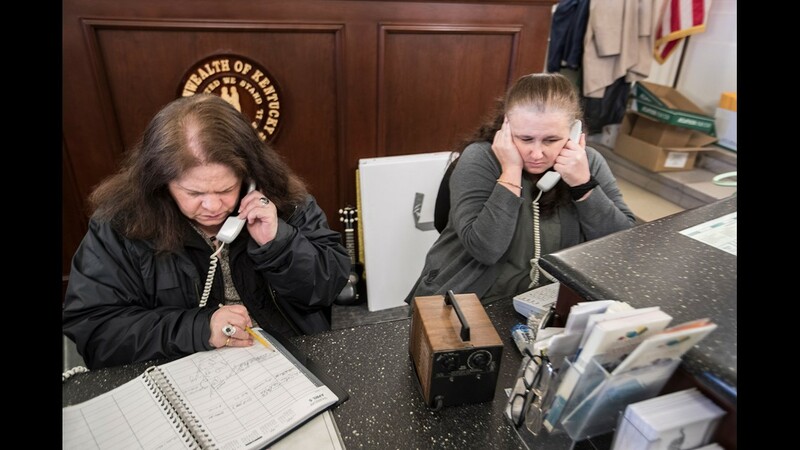 Linda Stevens, left, and Katie Forkner, right, tried to answer phones in the entrance of the Kentucky State Capitol while thousands of teachers entered the building to protest recent changes to their pensions. April 2, 2018. 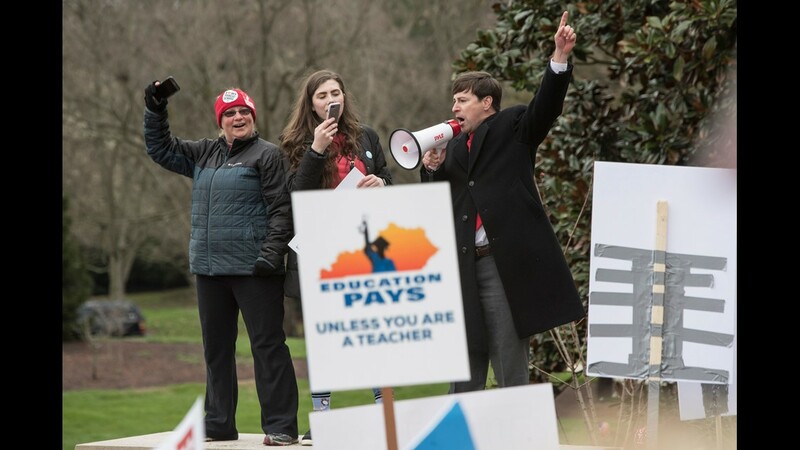 Kentucky State Representative James Key used a bullhorn to speak to the thousands of teachers and their supports who converged on the State Capitol to protest recent changes to their pensions. 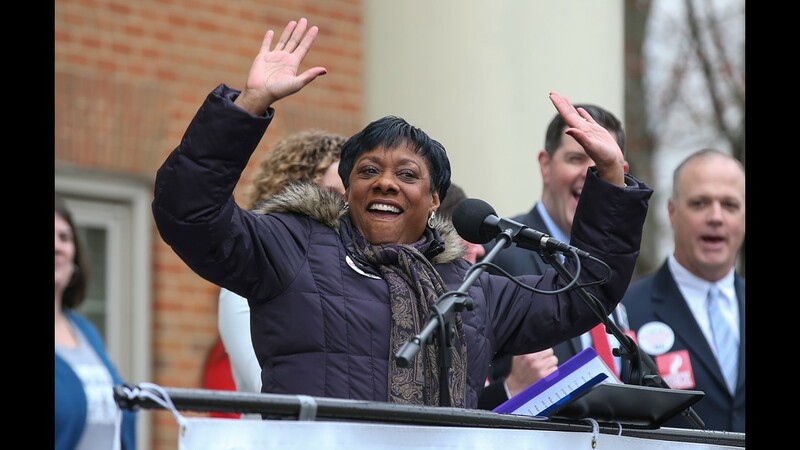 Key represents House District 56, Woodford, County. April 2, 2018. 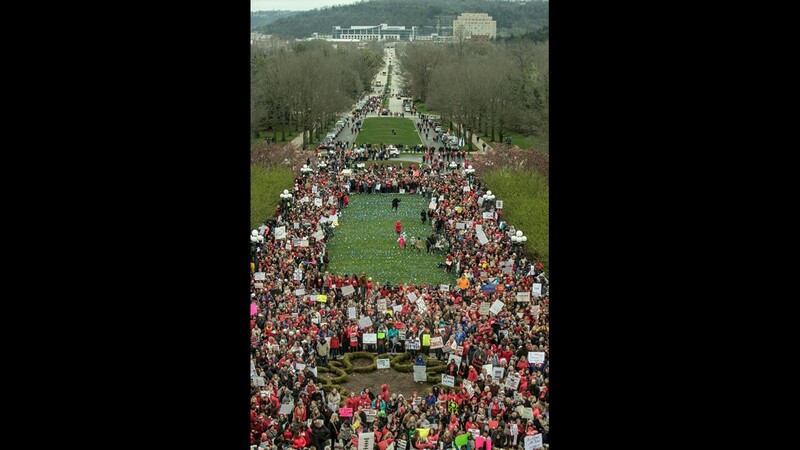 Teacher from across the state of Kentucky protester on the Capital steps in Frankfort, Kentucky. April 2, 2018.